HE ONLY made his debut at Globe Derby during the weekend, but Hesashark has a busy schedule ahead of him. Rapt with the two-year-old’s effort to win the Kindergarten Stake Prelude, trainer Dale Afford has circled several key features for the son of Shadyshark Hanover. Along with the Kindergarten Stake in a fortnight, Afford has taken aim at the Southern Cross Series in May and the Allwood Sales Series in June. “He’s got a lot to learn but has a lot of natural ability and good manners,” Afford said. “The hardest part with him is he always seemed like a natural two-year-old, so I’ve had to make sure I hold him back instead of rushing him. Driven confidently by Afford, Hesashark was pushed forward from barrier four to test the leader, Belladonna Girl, from the ‘death seat’. 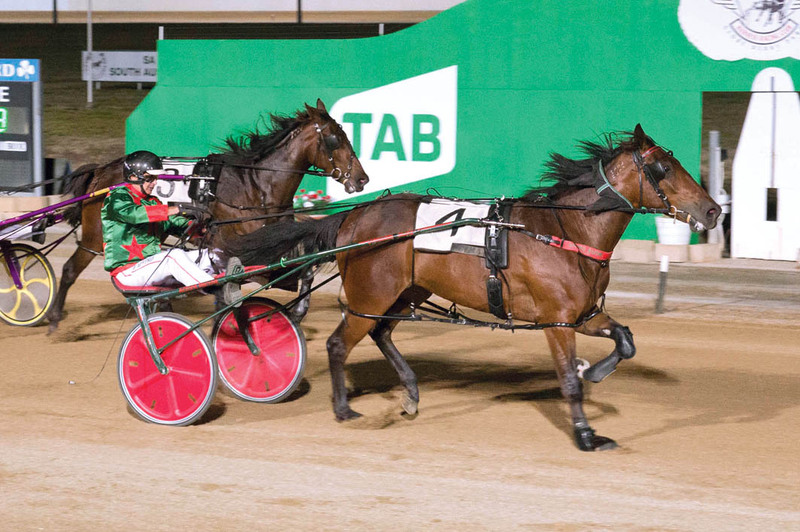 With the pair striding clear of the pack along the back straight, Hesashark forged his way to the front during the latter stages to score by four metres from the pacemaker, with Kensington Maid 14-and-a-half metres away third. Covering the last half in 60.4 seconds, the two-year-old rated 2:03.8 over 1800 metres. “He only had one trial, but he was a bit keen with the noise and other horses, so I put ears on him and he settled better in his race,” Afford said. “The problem was he was too relaxed so I pulled the ears off on the first turn and he got on the bit better. Bred in Victoria by Goodtime Lodge principals Ian and Judi Slater, the gelding was purchased from last season’s SA Yearling Sale, with Afford keen to return to this year’s edition on February 10.